Spring is peak tornado season for most states. 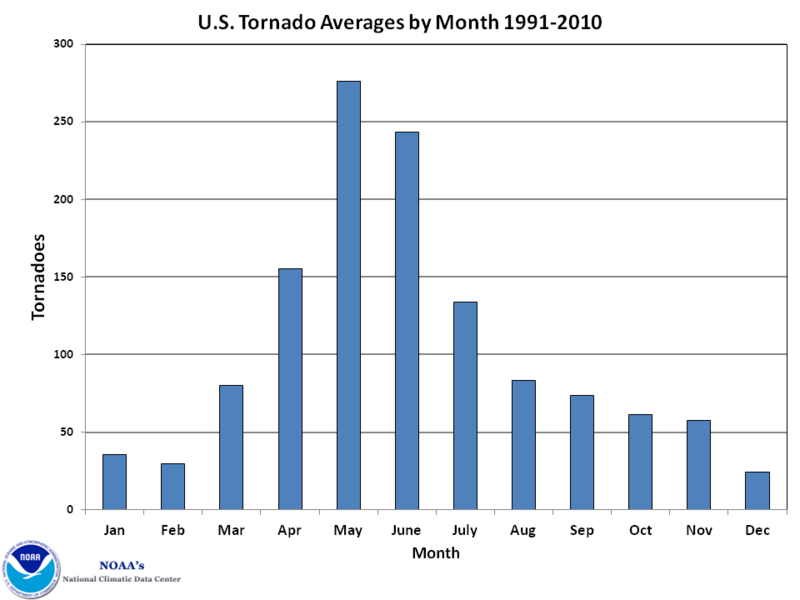 Spring signals the start of tornado season for most of the United States, with a peak in May and June. Now is a good time to prepare by checking your emergency kit, buying fresh batteries and updating your family’s emergency communication plan. The Federal Emergency Management Agency (FEMA) tornado preparedness website advises that you go to a pre-designated shelter area such as a safe room, basement, storm cellar or the lowest building level. If there is no basement, go to the center of an interior room on the lowest level (closet, interior hallway) away from corners, windows, doors and outside walls. Put as many walls as possible between you and the outside. Get under a sturdy table and use your arms to protect your head and neck. Ready.gov also urges all families to create a family communication plan and to assemble a disaster preparedness kit. Designate an out-of-town friend or relative to act as a contact point. If your family is separated, have family members check in with your contact person using a cell phone or prepaid calling card. Families who text may find that text messages can get through when cell phone or landline calls cannot. Assemble a disaster kit with food, water and emergency supplies.